Today we have snow in Colorado. 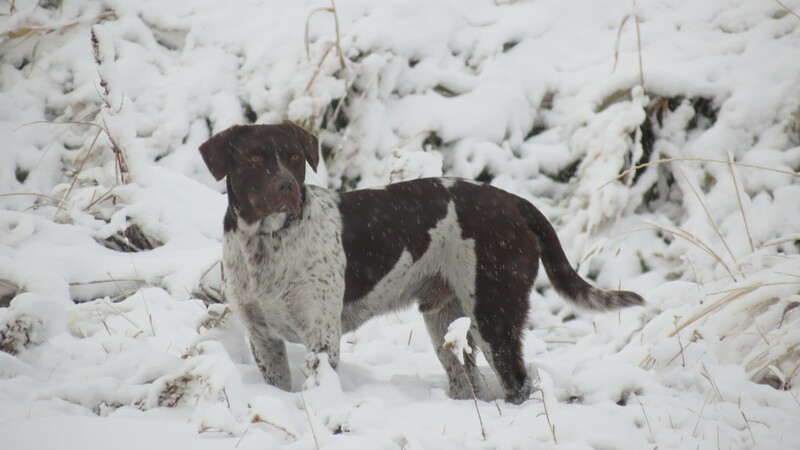 Here are two photos of our beloved Rover, taken last year. 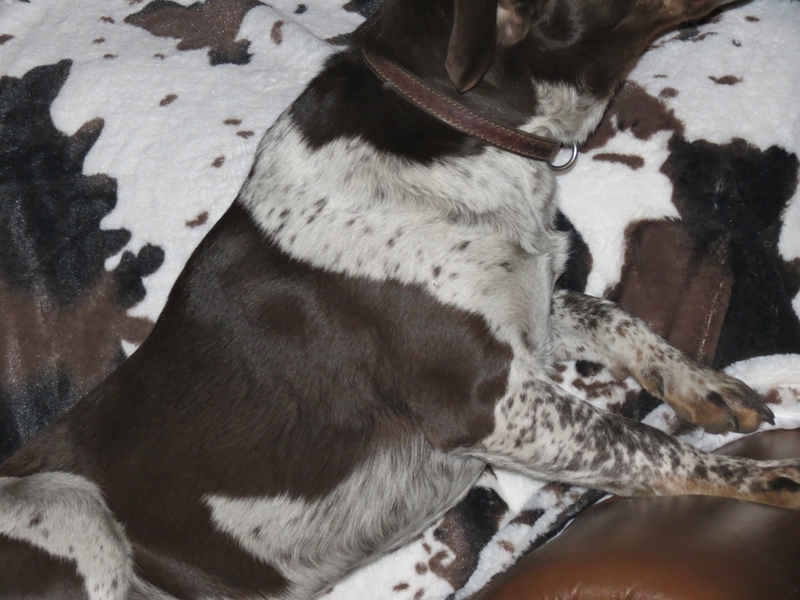 Here he is relaxing on a couch with a cowhide that matches his outfit. If you are interested in Rover’s story, type his name in the search box above recent posts and archives. We miss him still and always will. 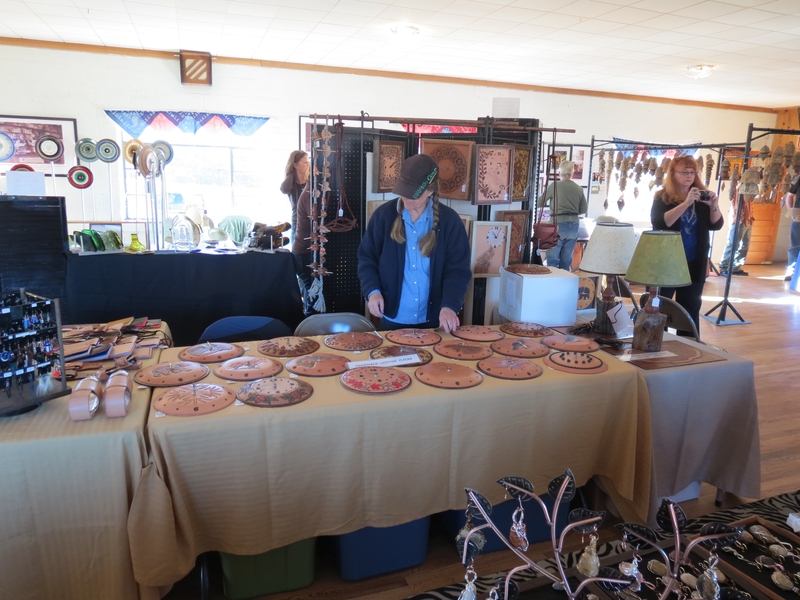 So I was sitting at this art and craft show at the Livermore Community Hall yesterday, minding my own business, when some lady comes up to me and sits on my lap. I was polite about it. Then a photographer snaps a picture. It turns out the lady is Miss Sugar, my trophy wife, and the photographer is our neighbor and friend, Bob. Octobercraft was organized by Sugar so my attendance was pretty much mandatory. I don’t mind. It was fun. 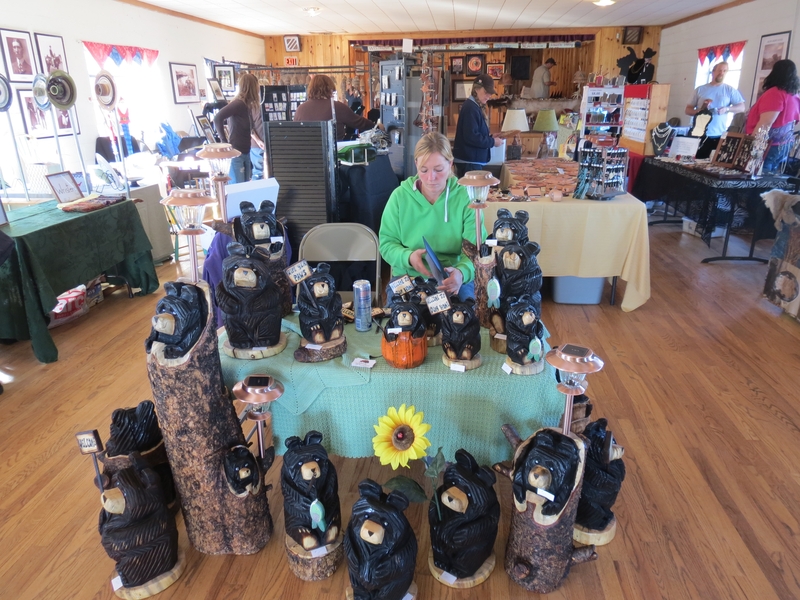 Sugar did a great job of getting artisans signed up, renting the hall, bringing in food vendors and a band. 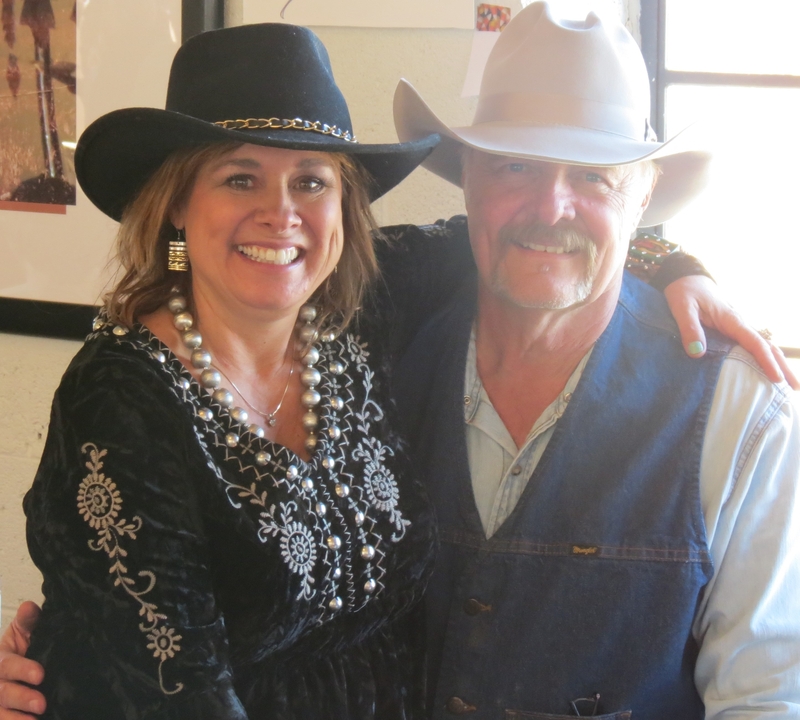 She runs my law office, so she did it all in her spare time as Supreme Art Advocate of Northern Colorado. God did an excellent job of providing perfect weather. A good time was had by all. Then, this morning, Sugar sang two songs in church and played the guitar. I’m proud of Sugar. However, let’s talk about me for minute. I fed the dogs, put them in the pen, and drove us to church. I don’t know how I do it all! I amaze even me. The Redskins are coming to Denver to play the Broncos on Sunday. That causes us to revisit the controversy about the name. This post is similar to one I posted a few months ago, but just as the controversy continues, so does my suggestion remain. I read in the news AGAIN that there is pressure on the Washington Redskins football team to change its name because Redskins is thought to be derogatory. I have a suggestion that would allow the team to keep the same logo pictured below. How about Washington Indians? The Cleveland Indians in baseball, of course, already are using that same name that I am suggesting, but we have both the Major League Baseball Giants in San Francisco and the NFL Football Giants in New York. Washington Indians would work. Keep the logo on the helmets. It seems respectful. On the flip side, the Cleveland Indians need to lose their logo. The poster above came from the American Indian Movement (A.I.M.) website. As I pointed out recently in another post on this blog, many actual American Indians call themselves Indians as well as Native Americans. The American Indian Movement is a group that sticks up for, well, let’s call them Indians since that is what they call themselves in their organization’s name . It is not the name Indian that is the problem. 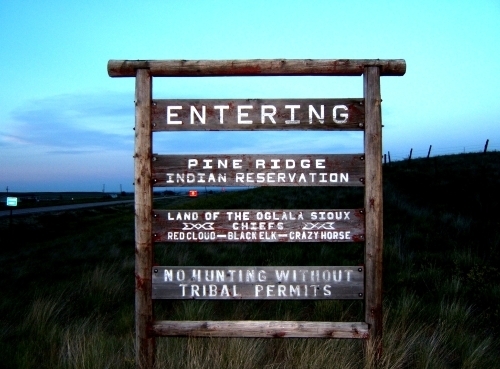 Below is the sign for the Pine Ridge Indian (not Native American) Reservation. 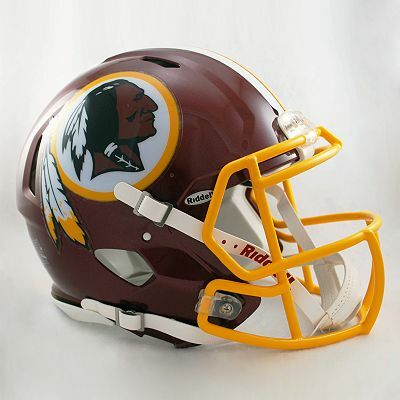 If Redskins is dropped as the name, just use the name that real Indians call themselves and, again, keep the logo. Now let us consider the names of two other professional football teams and an appropriate, very cool, even beautiful, logo. The fierce Minnesota Vikings logo does not seem disrespectful to me. However, I have a suggestion for them too. And for the Dallas Cowboys. I have a dream. Pick me! Pick me to represent both identities. If the Vikings merge with the Cowboys, I would like to be considered as the mascot since I am a Viking Cowboy by a combination of Scandinavian ethnicity and American West cultural circumstance. I hereby consent to my image on the right being displayed as the face of the Dallas Vikings, or for the Minnesota Cowboys, depending how the merger negotiations go. It could even be drawn as a caricature to be used as a logo, such as the Viking on the left as long as it is done tastefully and depicts my rugged good looks in a respectful manner. A team with that visual image looks to me like a winner! 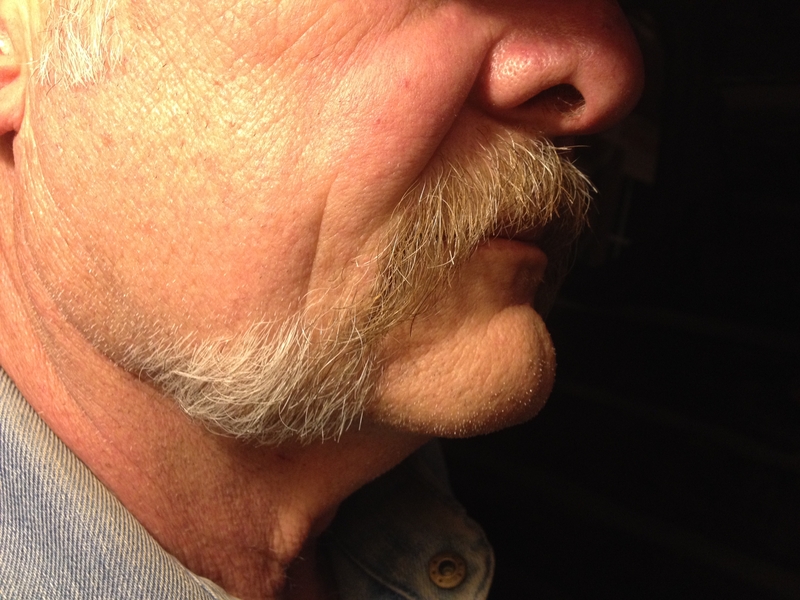 While they work out the details of the merger, I will work on the mustache and Viking braids. I already have a good cowboy hat. Optimists say the glass is half full. Pessimists say the glass is half empty. Engineers say the glass is twice as big as it needs to be. Thomas Edison comes to mind as a famous American inventor. He has over 1,000 registered patents. I concede that he has more patents than I have. However, ask yourselves this: What has Thomas Edison done for you lately? I will tell you what I have done for you and all of mankind this very day. I have made the world a better place. For cats. They say that “necessity is the mother of invention,” and that is certainly true for many of my most clever, as yet unpatented, inventions. Today’s invention is simple in concept while brilliant in practicality. I will try to explain it to those of you with engineering degrees. The rest of you will have to wait for the pictures. 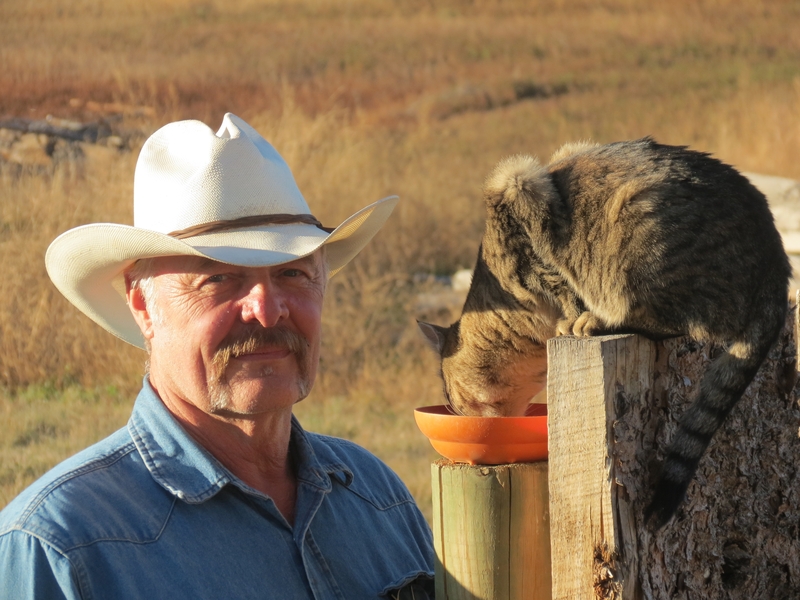 The Problem: Dogs eat our cat’s food if it is fed on the porch. If it is fed at a safe height, the bowl falls to the ground before the contents have been consumed. The Solution: Using a hammer, nail a plastic bowl to a post connected to a fence that provides seating during the dining experience. 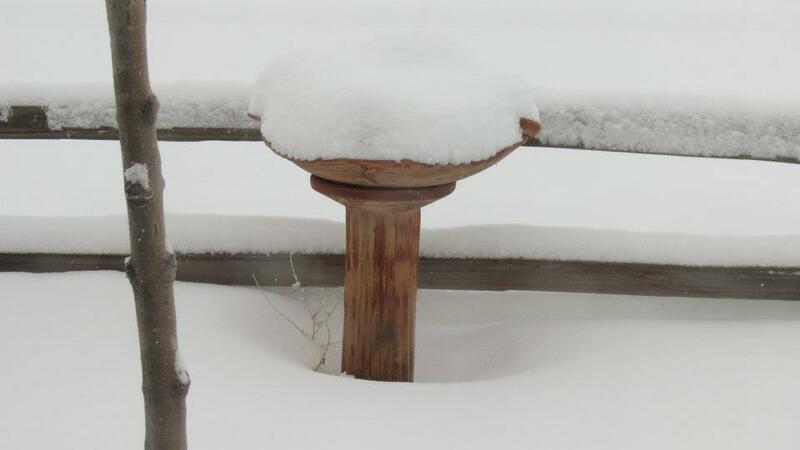 Prior to attachment, poke holes in the bottom of the bowl for drainage in the event of rain or snowfall. The inventor and the beneficiary appear below in a recent photo. 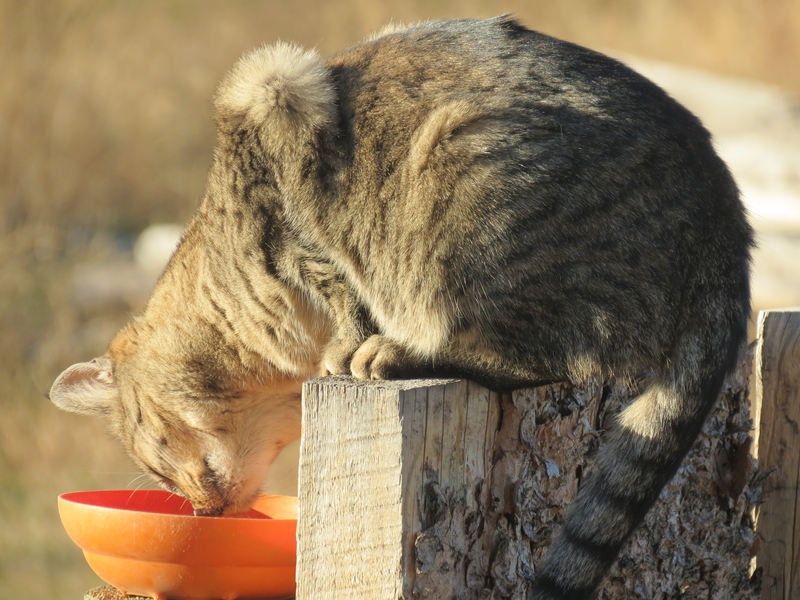 Note that the bowl is attached to the post, preventing it from falling to the ground and thus allowing the feline to finish her dinner in peace by facilitating its maintenance of height above the ground where non-climbing predators await. Last night threw me off my routine. 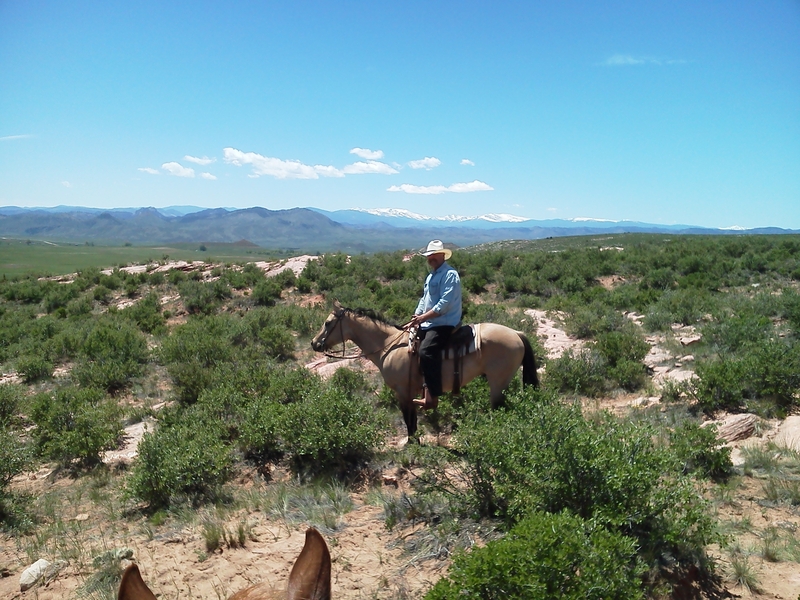 At our home on the range, we are out of the reach of cable TV and DSL internet. Instead, we have satellite dishes. The dishes are only about the size of large pizzas. We have two — one for TV and one for internet. In the nineties, we had a huge satellite dish that was maybe 8′ across and moved slowly to search the skies for connections to television stations. Then, with no kids at home, we discontinued that and just rented movies. We even read books. Eventually, I removed the dish and dug up the steel supports set in concrete and took the iron to Aragon Iron and Metal for scrap. Then we were without TV. It was rather a freeing experience. I had DSL internet at the office. That was all I needed. It also had the advantage (or disadvantage) of preventing me from doing law office work at home. I could not read emails. I could not do on-line research. 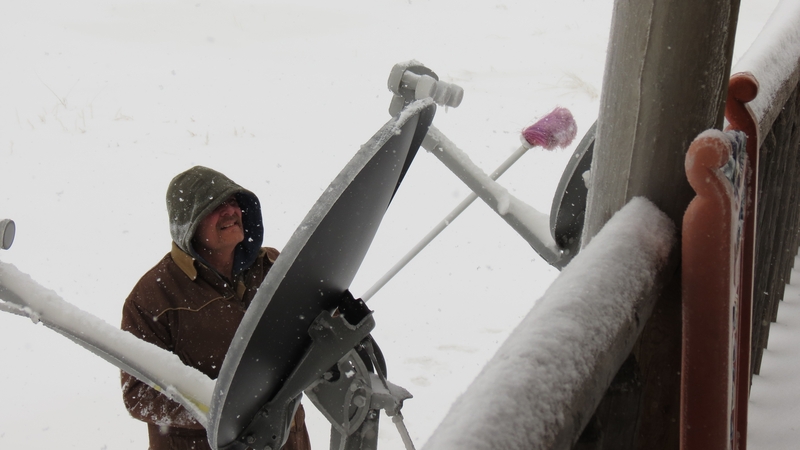 Usually the only times we have connection problems are when the weather is bad, such as when snow and ice accumulates on the Dish dishes. Yesterday was a beautiful day, so we were surprised that the thing-a-ma-bob by the modem only had three blue lights rather than the required five. What I did next is very technical. Those of you without engineering degrees probably won’t understand the significance of what I did to fix the problem. I unplugged the deal-ee-o, waited a minute or so, and plugged it back in. That usually works. It did not. Still just three lights blinking. Sugar unpacked the trusty hot spot and went about her internet use in the dining room. She also called Dish and tried to fix the problem but to no avail. She is a doer. She then scheduled with Dish for a technician to come out. I agreed to her plan for altruistic reasons. It was not because I myself could not analyze and solve the problem, it was for an altruistic reason — I do not want to hurt the American economy by causing unemployment among Dish technicians. So, without internet, I thought about reading a book, perhaps a text on organic chemistry, but the TV was still working so I watched The Voice, which furthered my desire to get on the internet. I will say that Cee Lo is a snappy dresser. In the morning, we had five blue lights again and a good connection. Apparently, I fixed it in my sleep. I fixed it with my eyes closed. Next time I will even try unplugging and replugging the device with one hand tied behind my back. I am sorry we had to cancel the technician’s visit. I hope they have other work for him today. Hey, Sugar — You’re welcome! Those of you who have read my many posts about my hot trophy wife have a favorable impression of her, no doubt, due to my propaganda on her behalf. And, she is a pretty nice lady, I admit. My posts are all accurate as far as they go. However, after what happened today, I feel compelled to tell you the rest of the story. Today, she denigrated one of my dreams. I do not actually gamble on sports even though I am an expert on football and basketball. Lest you think I am bragging, I hereby reveal to you that, through my participation in Yahoo Sports College Pick Em, I have an excellent record of predicting winners, putting me in the 90th percentile and above, even as high as the 99th percentile in one NCAA Basketball tournament a few years ago. Now that you know that, you will see how foolishly impractical it was for Miss Sugar to say what she did this very day. Apparently, Sugar lacks those particular character flaws because she threw cold water on my idea, on my dreams. I see what is going on here. She is jealous of my skills and is holding me back from riches. She might be insecure and fear that when we are extraordinarily wealthy, spending time in Las Vegas engaged in high dollar gambling activities, the show girls there will flock around me. P.S. I have got the Broncos over the Colts by 10. Game starts in 30 minutes. Get your bets in. No charge for the tip. P.P.S. Update: the Colts won. I guess it is good I did not bet the farm on the Broncos as I intended. ** Do you think any of them show girls used to be Miss Texas? Not a chance! As I was sleeping soundly, Sugar had started a fire in the wood-burning stove, so it was nice and comfy when I arose. I appreciated her efforts. You are probably thinking that we are good candidates for a gas-powered generator. You would be right. Then it was my turn. As Sugar stayed in bed, I went outside to get more firewood. Note: She did not have to go outside. She used the last of the dry wood in the house. In comparison, what a good boy am I! So I brushed off the snow and added wet wood to the fire. Then, no thanks to me, the electricity came back on. Our computers and internet service rely on electricity. However, even with the computer on after the restoration of power, I could not get on the internet. And here is where you will be impressed: rather than get Sugar up, I brushed off the satellite dish all by myself, just like a big boy. When Sugar finally came downstairs, the fire was roaring, the coffee made, and the TV and internet were working. What a good boy am I — in the daylight. Sugar does okay for the night shift. For a girl. I was in court yesterday at a neighboring county. It is my favorite courthouse because it has a central rotunda, stained glass windows in the stairway, and windows in the courtrooms. It was built many years ago. It looks like a courthouse should, to me anyway. During my career, courthouses have changed. Now every one of them has security screening equipment like at an airport. I know why. Still, the security stuff right at the entrance offends my sense of aesthetics. They have also changed in design. Many of the new courthouses that have been built in the past twenty or thirty years have omitted windows in their courtrooms. I feel like I am in a space station. I like windows and notice when they are absent. 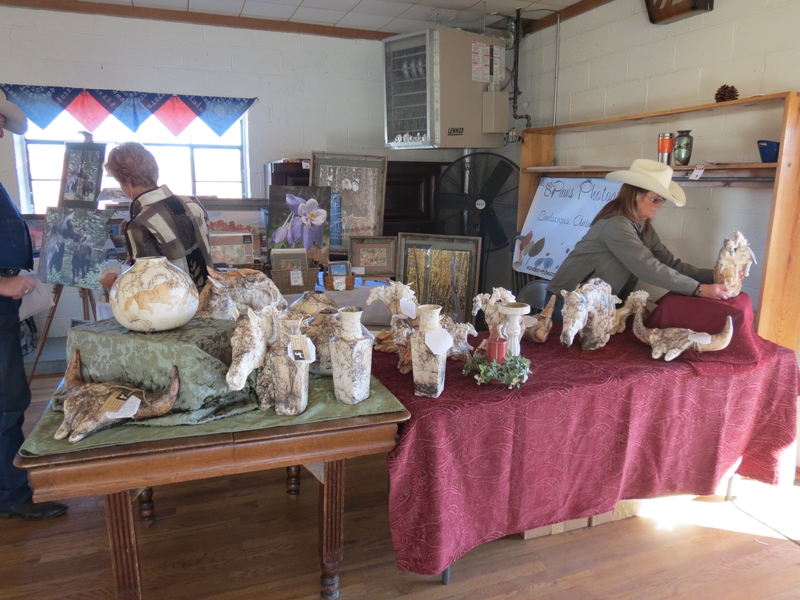 I have also been in church sanctuaries that have no windows. The church I grew up in has stained glass windows on each side of the sanctuary. Now many have the “dinner theater in the round” look. 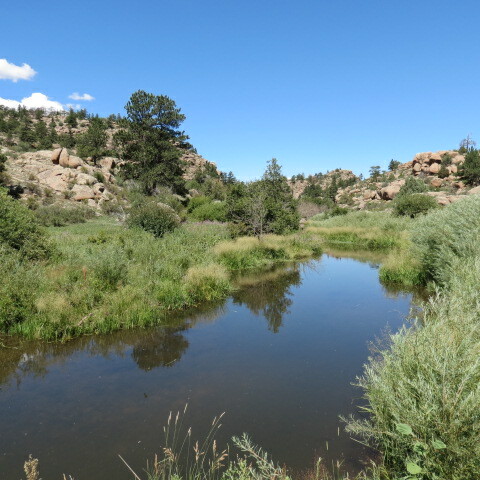 I seem to have some condition that craves sunlight and pretty views, which is why I love Colorado, a state that boasts of 300 plus sunny days a year, more days, they say, than sunny southern California. There is something I like even better than windows: being outside.